I finally got the ships for my Plague Fleet done. I was planning on doing 6 but looking at the figures I have I think 5 is more viable as the guys would look pretty thin on the ships with 6. The Beastmen Gor ship right now is the only one that is pretty full of crew. For the scenario we are going to be doing with them I need two of them to have at least 9" of space clear of any Nurgle models. That way the Stormcast can lightning strike onto the ships still and we can have a game at all. The assault will have to begin on the big ships, as that is where they will have the space to land. Of course Prosecutors and the Knight Venator will be able to land pretty much anywhere as they can fly, but they will still have to be the requisite distance away from any enemy model. 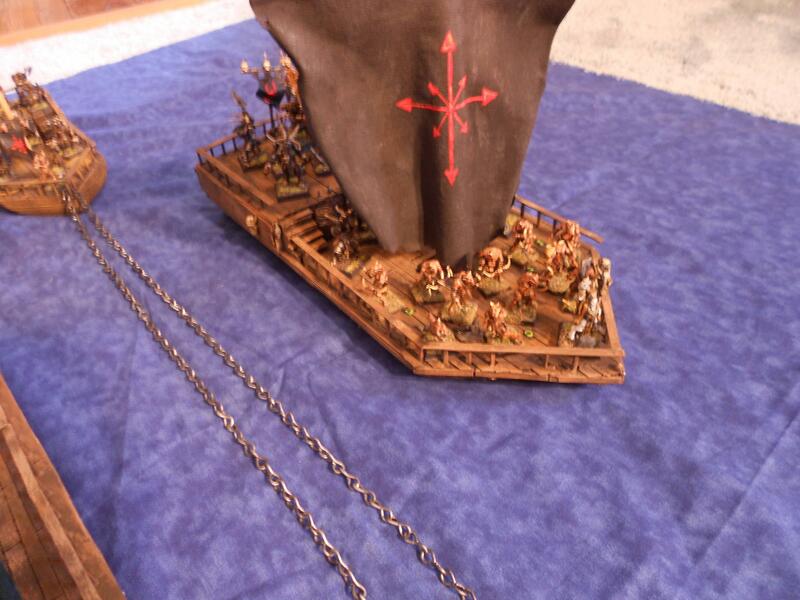 It is possible to move from ship to ship, and the Stormcast will have to do this to take all of the ships. 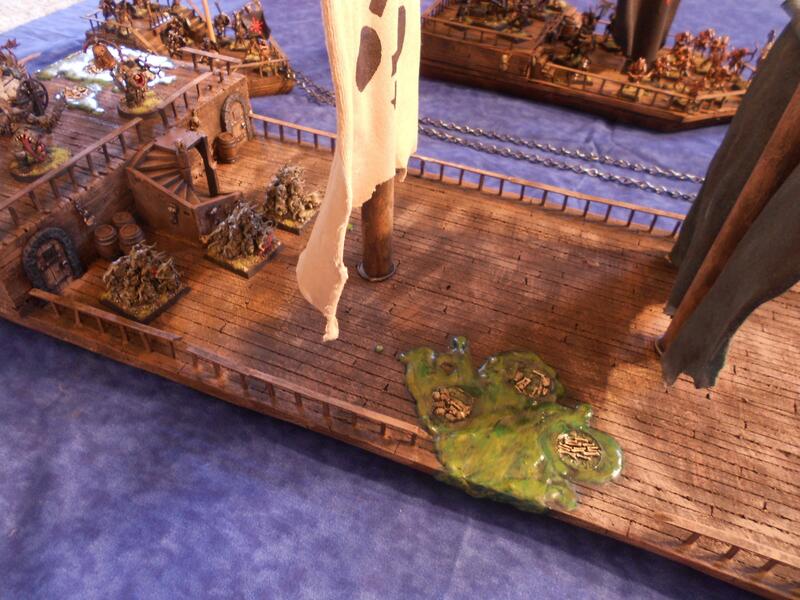 The Nurgle forces will probably want to do this too to reinforce the troops they have on ships that have been boarded. To move to a new ship you simply use all of your movement to do it and it counts as a run as well. If there are enemy blocking the way then it counts as a charge. Repelling boarders will be something you can do by moving to the side of the ship where you expect the enemy to be coming. If you are trying to board a ship and there are any enemy models blocking the path to the ship you are trying to board you count as charging them. Any attempted boarding actions will take place outside the normal back-and-forth close combat turn sequence. Instead all other fights on the board will take place as normal i.e. the side with the initiative picking the first unit to fight and then the other side picking a unit and so forth. When that is all done, then the boarding fights go. The side repelling the boarders always goes first. Then the boarders get to attack back, if any survive. 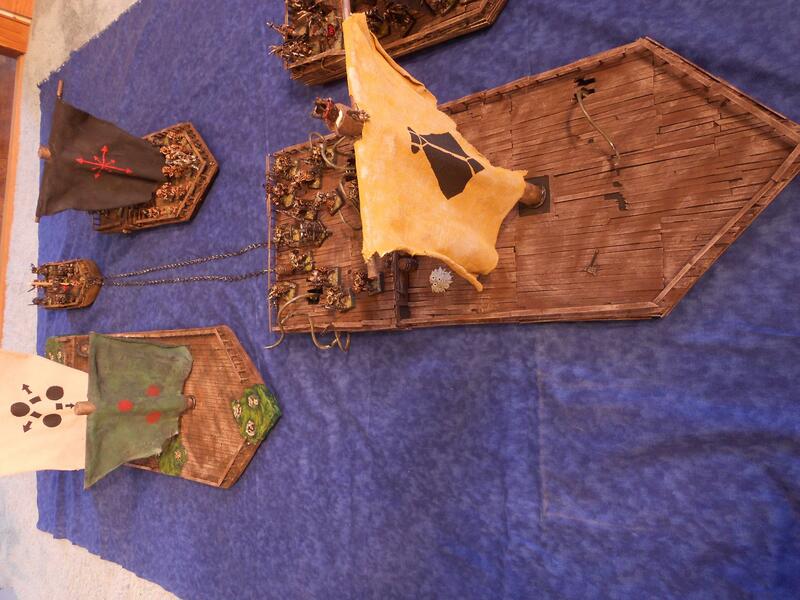 Boarding models are lined up along the side of the ship and can take the place on the ship of any model that they kill. Once a single boarding models has made it onto the ship the action no longer counts as a boarding action and the defending models are moved away from the side of the ship to make room for the models who have successfully boarded. Ultimately the Stormcast will have to take and defend the helm of four of the ships. The Ungor ship is under tow so if they can take the ship towing it, it isn't going anywhere either. There will be two units in the Stormcast army that will count as sunderers. These will be the two Paladin units, the Retributors and the Protectors. If they are on a ship in their hero phase they roll a d6, on a 6 the ship is so badly damaged it cannot continue to sail so counts as destroyed. We will be playing this at Phantom of the Attic on Craig St. in Pittsburgh on Sunday (August 14) starting at noon. You don't have to bring anything, all models, rules, dice etc. will be provided. I like those ships a lot! Really cool, thanks for sharing!! Is that an Infinite Crypt staircase? Glad you guys like them. I'll take and post pictures of the game after we play it on Sunday. And of course you are all invited to come.